A re-centering and holding tool for leather hard or bisque ware thrown pottery. Designed specifi cally for trimming, it works well for waxing feet or banding oxides. 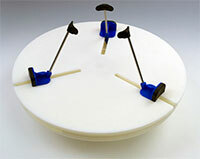 The three arms move as one to gently hold the pot on center on your wheelhead. After an initial one-time adjustment, the Giffi n Grip® simply snaps on and off your wheel.